There's really no legitimate excuse for not running an electric guitar rig in stereo. Some players will complain about having to lug the extra gear to shows, or the added technical challenges involved in going stereo, but when it comes right down to it, these arguments are based entirely on personal laziness. Everything should always be in stereo. Every human with a functional pair of ears knows instinctively that stereo is always better than mono, because real life is stereo. In both studio and live contexts, going stereo enhances depth, power, realism, and dynamics immeasurably, for listeners and players alike. At gigs, the audience will be more appreciative (even if they're not sure why), and for the guitarist, the sound on stage will be infinitely more inspiring, as well as naturally more immune to variability in the quality of monitoring and the overall mix on stage. And of course, for players that use delay and modulation effects, experiencing these tones in full stereo is powerfully addictive. So, how does one go stereo? Well, there are a number of different ways this can be accomplished, and each method has distinct benefits and potential downfalls that should be taken into consideration. There are also economic factors to keep in mind, as converting a mono guitar setup to stereo sometimes requires a gear investment, however, many players will already have everything (or almost everything) required, and will need only to take some time to set it up properly. I have a strong preference for the dual amp/dual cabinet method of achieving stereo guitar tones, for the simple reason that it sounds the best, and gives the player the widest range of tonal options. As I've mentioned in previous articles dealing with the subject, two amps are always better than one. With two amps power is increased, the overall complexity and richness of the tone is enhanced, and musical sustain and feedback are much easier to achieve. Take these two amps and run them in stereo, along with a stereo delay, reverb, or modulation pedal, and the sound becomes a fully enveloping, uniquely responsive musical experience. 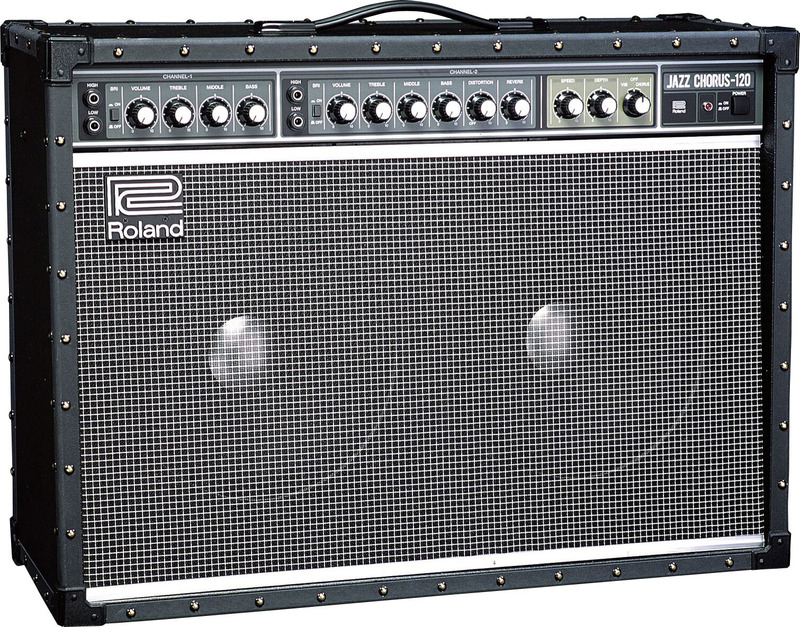 The simplest way to set up a dual-amp stereo rig is to use two amps of the same make and model, in either a combo or head-and-cab arrangement. Use an effect pedal or tuner with stereo outputs, or a dedicated ABY box, to split the guitar signal into two, sending each signal to its own amplifier. Using two of the same type of amp is the most hassle-free way of doing this, because it decreases the likelihood that phase differences and ground loop issues between different amp types will cause difficulties. On the other hand, I believe that the benefit of using two different amp types is more than worth the trouble, as it allows you to blend two distinctly different tones, such as the mid-range crunch of a Marshall and the scooped thump of a Fender, for a much more complex and compelling tonal mix. If phase difference or ground loop issues do occur, an excellent solution is a product like the Radial Engineering BigShot ABY. This passive, true bypass, ABY switcher pedal features a 180 degree polarity reverse for phase matching amps, and an isolation transformer with a ground lift switch for eliminating grounding issues. German company Lehle also makes a number of excellent switchers with similar functionality that are perfect for running stereo amps. If you do use two of the same amp, then phase and grounding issues will likely not be a problem, and you should be able to simply use a stereo stompbox of any variety to split the signal. Using stereo effects and creating unique tone blends are a couple of the biggest benefits to the dual amp setup, but the possibilities with a rig like this are endless. With an ABY switcher, you can switch between the amps, in addition to running them both at once, using one for clean tones and one for dirty sounds, for example, or with each set to a different yet complementary EQ setting. You can also keep one amp completely dry, while the other one handles the effects. Experimenting with physical placement can also be very rewarding, as you can easily create extreme stereo spread on stage by simply moving each amp to a different side of the stage. Kick on a panning delay or tremolo, and let the brain-melting psychedelia ensue! Another cool trick is to put a short delay in front of the second amp, which creates a kind of doubling effect to make the sound even wider and more massive. This maneuver is frequently employed in recording scenarios to mimic the effect of a doubled guitar track, and it works just as well in a live setting. There are a few different methods for running a rig in stereo using just a single stereo cabinet. These methods are more limited in certain ways than the multi-amp/cab method, as you can't alter the physical spread of the speakers, but they do cut down on the amount of gear needed as well as lugging around extra amplifiers and cabinets. A few possibilities for this kind of arrangement include using a single stereo amp running into a stereo 2x12 or 4x12 cabinet, two mono heads running into a single stereo cabinet, or just a single stereo combo amp. 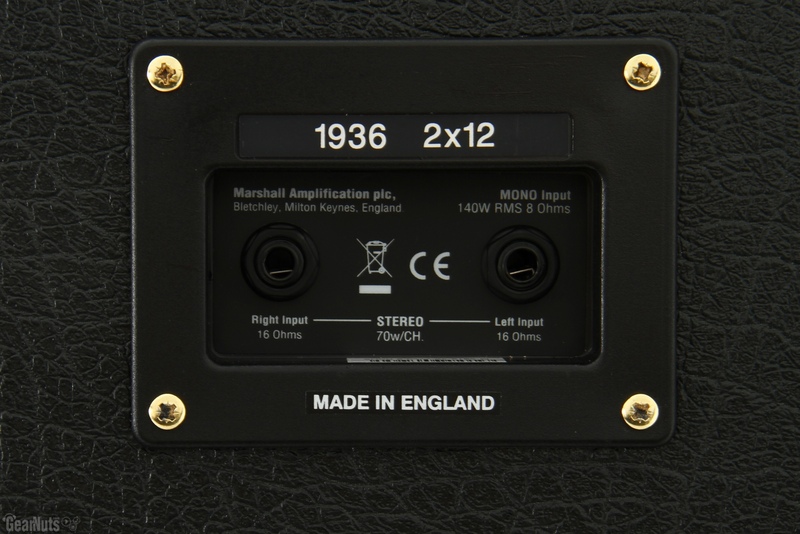 Mono/stereo guitar cabs like the Marshall 1960 4x12, or the 1936 2x12, are fairly common. True stereo 2x12 combos like as the legendary Roland JC-120, which consists of two separate mono 60 watt amplifiers in a single chassis, or newer stereo designs like the Blackstar ID260TVP, are also relatively common and are an easy solution for getting a stereo rig going. Stereo heads are much less common, for some reason, though companies such as Luker Amplifiers do make them, so most players going stereo into a single cab will likely use two separate mono heads with a stereo pedal or an ABY switcher to split the signal, as described above. The same rules regarding possible phase differences and grounding issues with different amp types apply, so be forewarned. Many players using stereo rigs these days are using modeling preamps, like the very popular Fractal Axe FX II, and either going direct to the PA or recorder with them, or running them into a stereo power amp and then into one or more speaker cabs. For non-technophobe guitarists who want or need a broad palette of sounds, this is a very effective and relatively simple way to put together a powerful stereo guitar rig (though it probably won't be cheap). In setups like these, the amplifier is just providing pure, transparent power, rather than tone, so virtually any sufficiently robust solid-state stereo power amp will do the job. These tend to be much more affordable and widely available than stereo guitar heads, as their primary use is in full-range PA systems. Guitarists who still yearn for a little tube character in their rig should check out some of the tube-powered stereo rack amps from Mesa-Boogie, Koch, Engl, and other companies. There are more possibilities now than ever before for the guitarist that wants to run their rig in stereo, and the creative options available with such a set up are nearly endless. Even players that don't use much in the way of effects can benefit from the greater girth, power, and complexity that is inherent in a stereo guitar rig. Sure, there might be a bit more heavy lifting involved, and setup might be slightly more complicated, but the end result is more than worth the effort, so resist those lazy tendencies, split that guitar signal, and get your stereo on.